I have alway been curious about the origin of my maternal 2nd great grandmother's name, Jonas Bryant. Why the name Jonas? I thought that was typically a man's name. It would seem to me that for her to be named this, there must be some sort of family connection, but to who? Jonas Bryant's parents were Henry Bryant and Caroline Ellison Bryant who I featured already in the 52 Ancestors Prompt Series. I know who Caroline's siblings were and none of them were named Jonas. Could the name have been of significance to her father Henry? From Wikipedia I found this information regarding the meaning of the name Jonas. 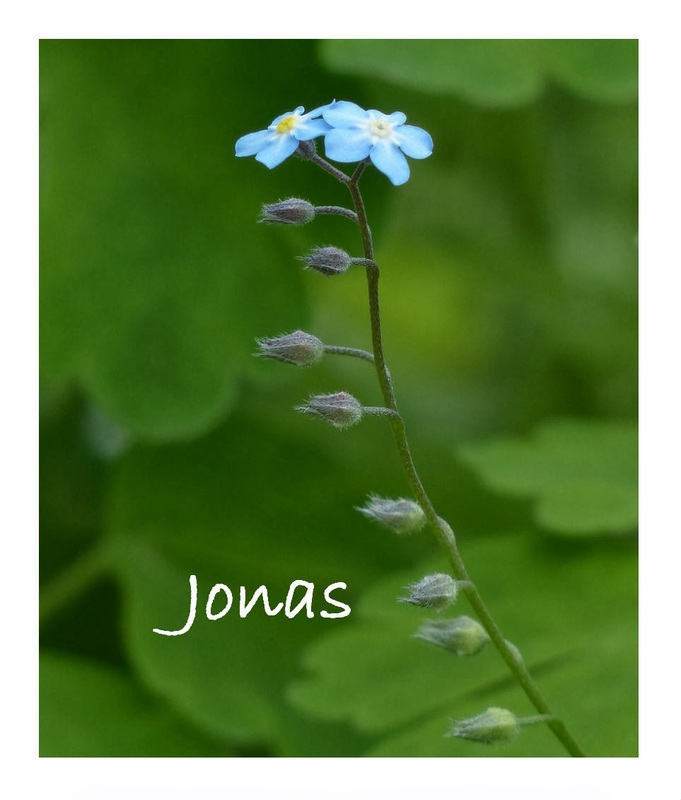 The name "Jonas" has several meanings, and the meanings vary depending upon the several origins of the name. The Hebrew version of the name means Dove; a symbol of Peace. From this it is assumed that the name Jonas means a peaceful being. The Biblical version of the name includes the Hebrew meaning, but additionally means someone who is a 'destroyer' or 'he who oppresses'. As a variation of Jonah, it can be considered to mean 'accomplishing', and a 'gift from God'. I find it interesting the dichotomy of meaning. On one hand...a "symbol of peace" but on the other "someone who is as destroyer." I wonder if this internal dynamic existed within Jonas's personality? What I do know about Jonas is this. She appears to have been the oldest out of the children born to Henry and Caroline Bryant. The 1870 census showed her age at the time was 3 years old, making her date of birth some time in 1867. She was born in Beaufort, Carteret, NC along with her sister Sidney. She made the move to Morehead City with her family by 1880. It appears that during her lifetime she worked as a maid or cook for various private families. I know her son Frank Bryant, my great grandfather, worked for Charles Slover Wallace of the area so I wouldn't be surprised to find out that she had worked for Wallace family as well. Jonas Bryant was the mother of my great grandfather, Frank L Bryant, and his sister Mamie Cole Bryant Johnson. She may have also assisted with raising William Bryant, the son of her sister Rose who I believe died prior to 1900. All the Bryant family members just mentioned resided together with the matriarch of the family Caroline Bryant on Avery St in Morehead City, NC. My 3rd great grandmother Caroline Bryant died on August 1, 1920. In my post The Ellisons and Bryants --Part one, I featured a deed that showed the transfer of ownership of Caroline Bryant's house to her daughter Jonas. For the purchase price of $45.00 and "their affection" she was able to have a home and a sense of security. 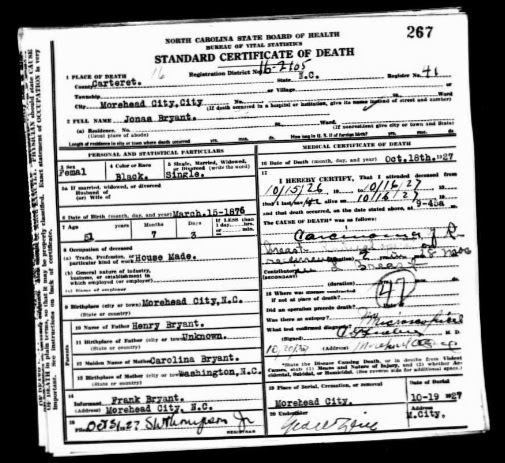 Jonas Bryant died on October 18, 1927. According, to her death certificate, the cause of death was due to breast cancer. She was a tough lady because she had apparently had an initial diagnosis of cancer in her right breast 2 years and 18 months before her death and had a "radical operation" which I take to mean mastectomy. The disease came back in her left breast and sadly was the cause of her demise. 1909-1975 [database on-line]. Provo, UT, USA: Ancestry.com Operations Inc, 2007. To see Jonas Bryant's will, check out my post The Earrings. I like this story. Does breast cancer run in your family? Thanks Minnie! On this side of the family, thankfully the answer is no. My dad's sister died from breast cancer so it is something that is on my radar. Yes! I know I am blessed to have so many ancestors come from North Carolina and that there's a lot of documentation available about them. Thank you so much for your comment.